Admit it: you have probably been embarrassed to wear a photographer’s vest, even though you figured it would be extremely handy, just because you were afraid it would also make you look like a gadget freak. Well, those days are over. With the development of the new slender profile “ScotteVest,” most all of the image problem has gone away. The ScotteVest’s pockets are all but invisible — and tech-enabled. It was recommended to me by a great friend and, I’ll have to admit, he was spot-on. These vests become a walking, incognito extra airline carry-on. My camera fits in one pocket, my flash or water bottle in another, and I still have PLENTY of space for a lightweight mini-tripod, a small flashlight, hand sanitizer, passport (in a protected, waterproof pocket), hand sanitizer, and virtually everything else you wish you had on the trail or village visit — up to and including iPads even. But please watch the color you choose. Some of the black vests seem a bit too paramilitary-looking for our tastes. 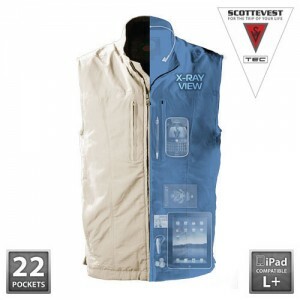 I have several of the ScotteVest products and love them all. I love traveling with the Alpha jacket as I can carry everything that I need on long trips without worrying about my bag that I stick in the overhead. Another great feature that they have is a rfid protective pocket to protect your credit cards and passport from e-theft. I love my ScotteVest. I travel to Africa, Central America, Asia – basically everywhere. It’s not uncomfortable and washes easily. I’ve seen a lot of negative comments online about the new verses the old versions of ScotteVest. Many have mentioned weak zippers and cheaper materials in the newer versions. I’m thinking of purchasing one, but am hesitant because of these negative reviews. Also, there are 3 or 4 versions of the vest including QUEST. Is there any difference between them other than the number of pockets?